Title: "Tab. 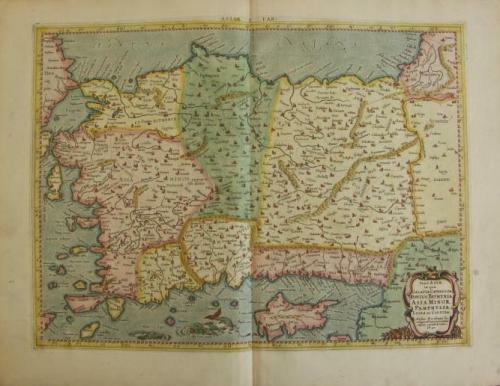 I. Asiae, in qua Galatia, Cappadocia, Pontus, Bithynia, Asia Minor, Pamphylia, Lycia, ac Cilcicia, ..."
Finely engraved, this classical map of Turkey is after Ptolemy from the renowned Gerhard Mercator. In very good condition with only a small worm trace on both sides of the middle fold, minimal loss.